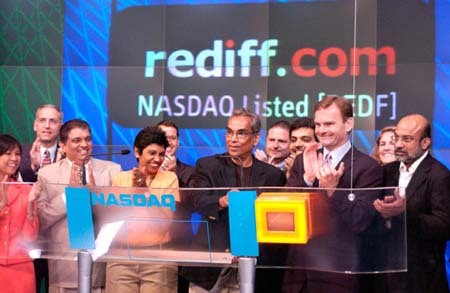 Nasdaq, June 14, celebrated five years of Rediff.com as a listed company. Chairman and CEO Ajit Balakrishnan was invited to ring the bell, at 9.30 a.m. sharp, to signal the start of the day's trading while company staffers and Nasdaq executives cheered. Outside, images of the function streamed, live, onto Nasdaq's giant 70-foot LCD screen that is a Times Square, NewYork landmark.